Yep, that is what Mikatan posted today – Nendoroid Kagamine Rin: Cheerful version and Nendoroid Kagamine Len: Cheerful version are slated for December 2011 release (for Japanese) or January 2012 (for International order) with a price tag of 3000 Yen. They are coming along with new parts and accessories, including flags, whistle, megaphone, and pompom. 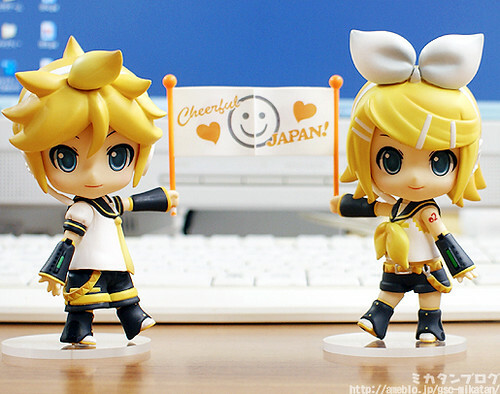 This entry was posted in News and tagged cheerful japan, kagamine len, kagamine rin, nendoroid, support. Going to try and find a proxy for these – not buying from GSC directly again after the way they completely screwed up shipping on Miku. Good news on support Rin and Ren tho, can’t wait to see what we get as a support figure next. maybe i will get them because i can’t afford the old one. len’s faceplate is kinda different though…. I think they have the new face plates …..? I could be wrong but are those the new eyes that came with Miku ? I have the original Rin and Len so ill have to double check ……. I like how they can’t even be assed to recolor them or anything. Pass. Umm… if you can see at the bottom of the post, or below the shipping info, thers actually a statement about KAITO nendorooid.